What does thermometer recalibration entail? Your instrument will be examined under magnification for any chips, scratches, impurities in the bore or other defects which may impair its function. Any separations of the liquid will be repaired without charge. If the etchings are faded, the scale will be repainted without charge. Your instrument will be compared to NIST traceable reference standards at the test points you specify, in accordance with appropriate ASTM and NIST test methods. A new NIST Traceable certificate of calibration will be issued, valid for the period of time that you specify. This certificate meets the requirements of ISO 17025, ANSI-NCSLI Z540.1, ISO 9000, and virtually all regulatory authorities. A durable calibration sticker will be affixed to your thermometer with the date of calibration, recalibration due date and other appropriate information . The instruments are our responsibility on return shipment to you. We pack them extremely well. If any are damaged in transit to you, you will receive a prompt, no charge PRIORITY replacement. No questions, no hassle. Your instrument(s) will be registered in our Customer Registration database. This will enable us to inform you in writing one month before the expiration of your calibration certificate that recalibration is due, and permit us to keep you abreast of any changes in industry regulations which may affect your calibration. Why is it necessary to have my calibrated thermometer re-calibrated? When a thermometer is heated, the liquid within the bulb expands and is forced upward into the capillary where its level indicates the temperature value. Each heating and cooling cycle imparts stress to the bulb. After repeated use, even the highest quality liquid in glass thermometer will experience a slight change in bulb volume due to this expansion and contraction. When this change takes place, the indication of the thermometer will also change. Recalibration of the certified thermometer updates the indications and thus allows the user to maintain accurate, reliable and consistent results when making temperature measurements. When your instrument is calibrated, it is compared to NIST certified primary master standards at the test points specified by the customer or ICL, in accordance to ASTM and NIST test methods. A new NIST Traceable certificate of calibration will be issued, valid for the period of time that you specify. This certificate meets the requirements of ISO/IEC Guide 25, ISO/IEC 17025, the FDA, the EPA, and the ISO 9000 & QS 9000 series of quality standards. Sample Calibration Report. Recalibration at regular intervals to document traceability to NIST is an important part of most quality programs such as the ISO 9000 series of quality standards. How often should my thermometer be recalibrated? How do I arrange for my thermometer to be recalibrated? Simply fill out a recalibration form and send it to us with your thermometers. If you do not have facilities to safely package your glass thermometers, we will loan you a case for shipping (no charge). Fax or email us the recalibration form, (be sure to check the ‘Please send me a shipping case!’ option), and indicate the length of each thermometer. We will send you via UPS a reusable shipping case into which you place the instruments (we’ll include instructions), snap the case closed, affix the supplied return label, and ship it back to us via the carrier of your choice. Your instruments will be returned to you, with calibration reports, in standard packaging. I have an upcoming audit. What's the turn-around time? Normally 5 to 7 working days at our facility. If you have an emergency, let us know and we will make certain your deadline is met. We also offer a wide variety of NEW NIST Traceable calibrated thermometers, ASTM, SAMA and others, available for immediate shipment at competitive prices. Prices indicated are per point tested. Help on choosing test points. Prices include pre-calibration examination, calibration, and issuance of report document. Note: Digital thermometers or other thermometers (such as bimetallic thermometers) which require adjustment, and for which “As Found” and “After Adjustment” readings are required, are tested at the specified test points, adjusted, and then tested again at each test point. Because of the additional labor required, a 30% adder to the prices determined from the table above is applicable. Price is based on a calibration consisting of 5 test points (two low temperature points, typically -196 °C and -38.834 °C, TPW (triple point of water, 0.01 °C), and 2 or 3 high temperature points, typically 156.599, 231.928 and 419.527 °C). Adding additional test points increases the precision of the calibration – and the price; additional test points may be chosen from pricing table above. 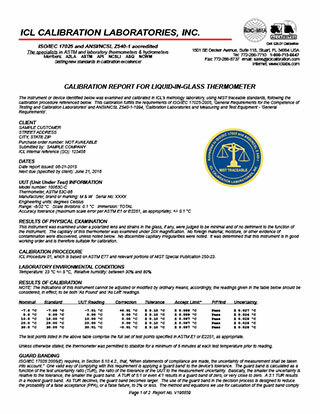 Price includes pre-calibration examination, calibration (recording ‘as found’ temperatures and resistance values), calculation of characterization coefficients from the obtained values, performing the calibration a second time to obtain “as left” values, issuance of report document including a table of resistance values to corresponding temperature across the range at which calibration was performed.